The weight of whole package is 2.75 lbs. 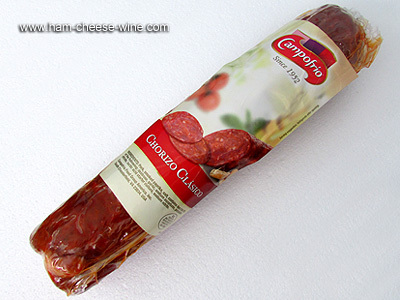 Cantimpalos sausage Campofrío is a sausage and cured product made from fresh fatty pork meat that has salt and paprika added as basic ingredients and undergo a healing process in natural dryers. With an exquisite aroma and intense flavor ideal for the most demanding palates, it is perfect for an elegant dish of sausages, ready to cut and serve. It can be served whole, in pieces or in very thin slices. Cantimpalos sausage Campofrío was made at first in Cantimpalos, Segovia province, and today is made in the area covered by the Protected Geographical Indication (PGI) since 2008, as it is part of protected foods from Castilla and León. 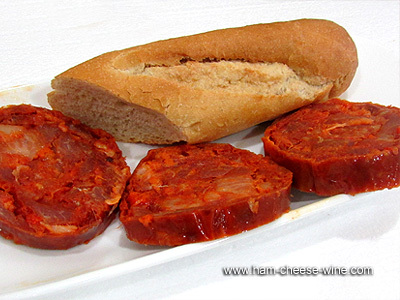 Cantimpalos sausage Campofrío is made from pork meat (essential ingredient that comes from pigs fed for at least 3 months prior to slaughter with 75% cereals), paprika, which must be at least 50% Vera paprika, and salt. It should not have bacon nor preservatives added. 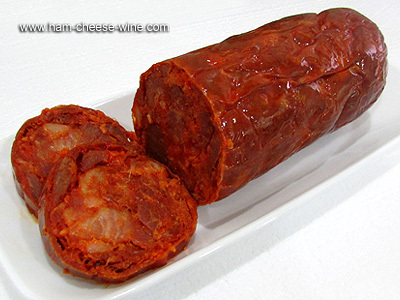 There are three formats of marketing Cantimpalos sausage: string, whose curing will be at least 21 days; chorizo-style, cured at least for 24 days, and that made with the final part of the pig’s gut, of more caliber, that will require 40 days curing. 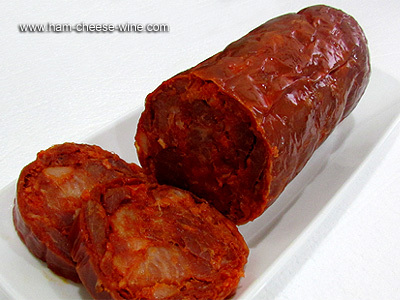 Among the organoleptic characteristics of Cantimpalos sausage Campofrío are its firm consistency, an intense red color dotted white due to the presence of pigmented fats and a fully homogeneous mass. 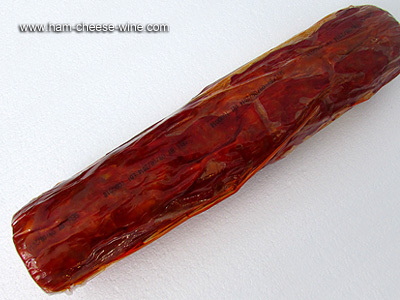 It is juicy, easily chewable, little fibrous and very palatable without spiciness. (in refrigeration chambers at a temperature of 2-7 degrees), curing (in two stages: ripening and drying), packing (vacuum), labeling (whole Campofrío sausages are labeled by placing the manufacturer's label with a name tag of the protected geographical indication attached to the surface or either tied or casted. 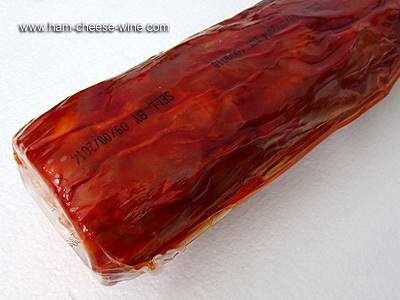 The sliced sausage is directly labeled on the packaging. According to the format of Cantimpalos sausage Campofrío, it has different morphological characteristics. If in the form of string, its surface will be dark, smooth without chunks of external fat. If it is chorizo-style, the surface will be dark, smooth with the presence of external flora and a sandy whitish appearance. If it is made with the wider part of the gut, the surface will have flora of sandy whitish appearance in part or all of it, showing a green cast from the oxidation of the gut. For this product to have the proper physicochemical characteristics of the Cantimpalos Sausage Campofrío it must have a humidity of about 20%, 40% fat on dry matter, 57% protein, 30% hydroxyproline, 0.5% carbohydrates and glucose up to 1.5% in the string and chorizo-style forms. Ingredients: Pork fatty meat obtained from registered farms with meat content between 70 and 80% lean and 20 and 30% fat from flank, ribs, shoulders and hams, boneless hams and boneless shoulders. Ripe and clean paprika in varying amounts between 18 and 25 g per kg of meat. Refined sea salt between 15 and 22 g per kg of meat. Garlic and oregano. Additives: Phosphates, ascorbic acid, citric acid and milk protein. No dye is added.